Should I Use Fertilizer Or Pond Dye In My Pond? 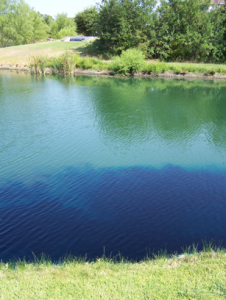 Use dye for a backyard pond not managed for angling. If you’re contemplating this question, what’s your goal? Is the lake a waterscaping with no fisheries management plan? Are you a passionate angler on a mission to grow quality bass? If the answer is waterscaping, you’re seeking an aesthetically pleasing view with no unsightly vegetation. To thrive, aquatic plants require certain water temperatures, sunlight to stimulate photosynthesis, and nutrients that feed plants. There’s not much you can do to control water temps during summer months, but you can inhibit sunlight and nutrition by applying dye. Products are available in blue or natural green shades. Dyes contain no ingredients that provide nutrition. Most important, they establish a sunlight barrier near the surface to reduce sunlight. Dyes are available in water soluble packets and must be replenished every few weeks to maintain certain visibility, but they are effective. Note dark blue dye spreading in the foreground. Products are available in dark blue or natural green shades. If the goal is producing healthy fish–fertilize. Biologists agree that fertilizing can double or triple pond productivity by strengthening the food chain. The process grows plankton, a crucial forage for newly-hatched fry. Fry are born with a yoke sack that feeds them for a short period. Once consumed, the fragile fish must feed on microscopic plankton. When balanced plankton is present, survival rates increase greatly. If not, survival rates decline rapidly. Keeping large schools of fry healthy for 45 to 50-days dramatically strengthens food chain dynamics. Successful fertilization requires certain temperatures, alkalinity levels, and products with high phosphorous content. Consult your biologist before applying. Properly used, plankton growing near the surface can aid in blocking sunlight for vegetation management. When not used correctly, fertilizer can feed vegetation and compound plant problems. If fertilizing, regularly measure water visibility with a secchi disk (Google the disk image.) Simply lower the disk into the water. It should disappear from sight at 18 to 24-inches. Should lesser readings occur, immediately call your biologist. 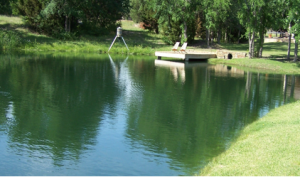 If your goal is raising quality bass, fertilize. Fertilization produces plankton, increases baitfish survival rates, and strengthens the food chain. This entry was posted on Thursday, June 14th, 2018 at 3:43 pm	and is filed under Articles, News & Updates. You can follow any responses to this entry through the RSS 2.0 feed. Responses are currently closed, but you can trackback from your own site.